This role covers multiple specialty lines of business (including Marine, Aviation & Terrorism) whilst also giving you the chance to get involved in interesting projects with Brexit risk solutions, risk management and M&A transactions. 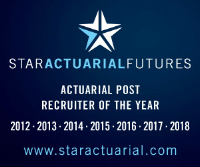 They are looking for a part-nearly qualified actuary who is looking for a new challenge. Reinsurance experience is not needed you merely need an interest to learn about this industry. The ideal candidate will either have prior Pricing experience in a Lloyd’s or London Market firm and should be making good progress with their actuarial studies. Programming skills would also be looked upon favourably.